To kick things off, Michael Jacob who is a script consultant and former executive producer for the BBC gave an overview of the importance of script editing. Michael has worked on more than 350 broadcast episodes of sitcoms and sketch shows, including Birds of a Feather, Goodnight Sweetheart, My Family and 2 Pints of Lager and a Packet of Crips. We then heard from Joanna Blake who is the comedy entertainment development producer for the BBC and is interested in finding fresh comic talent and helping to develop new writers. Joanna has worked on shows for Channel 4, Hat Trick, BBC 3 and Freedom Productions. A good discussion followed about how best to submit new work for televison. The winner of Virgin Media Shorts, People’s Choice award was up next. Jason Wingard showed us why he made such a worthy winner with hishilarious short “Where to mate?” baesd on the random ramblings of cab drivers. A series of sketches were performed next by Chris Lumb and Natalie Smeaton and readings from Luke Archer followed. 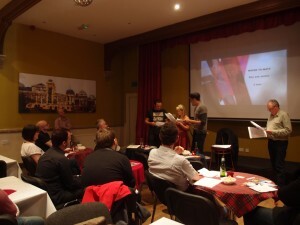 We were the treated to a series of short films that had been Screened at the Cofilmic Film Festival in 2011 before Matt Lewney and Hedley Brown performed “Danger Hour” to round off the evening. All in all, a greve event and one that we will no doubt repeat. Watch this space.